It’s time for babies to make a mess at Gallery Oldham! 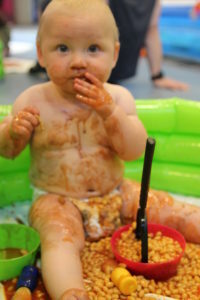 With the roaring success of our pilot Art Bites sessions Gallery Oldham is delighted to bring you the new, permanent, monthly messy play sessions for babies aged 0 – 2. These sessions are ideal for babies, non-walkers and toddling babies, who enjoy multi-sensory experiences and don’t mind messy play! Each month enjoy a mixture of materials including edible paints, home made playdough, cooked pasta and much more. All messy materials are taste-safe, non toxic and safe for mouthing babies. And even better, no cleaning up mess at home! Please be aware it is essential to book online but payment will be taken on the day, where possible please bring exact change. Cost of the sessions is £2.50 per baby, adults are free.